Renowned worldwide for its spectacular New Year's eve display. Marcus and I were both looking forward to welcoming our New Year down under. With the help of the Sydney NYE app we selected a vantage point. 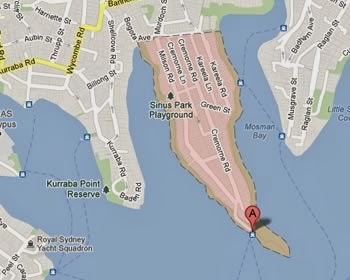 We decided that Cremorne Point would be best for us. Located on the lower North Shore of Sydney, the harbour-side suburb provided excellent views of the Harbour Bridge and the Opera House. Equipped with our picnic and alcohol we headed down to Cremorne point for 7pm, as we also wanted to watch the 9pm fireworks. Whilst it was very busy at the point Marcus managed to find a good spot. Little did we know that it was private property ... thankfully the owner agreed to let us picnic here along with his friends. We were very fortunate as the police were unable to confiscate our alcohol here! Pleased with our spot and view we tucked into our picnic which consisted of chicken rolls, crisps, chocolate and sweets (very healthy ...). More importantly along with our wine we had also treated ourselves to a bottle of vodka, which went down very nicely! It was soon 9pm and after an aeroplane stunt show it was firework time. The fireworks were brilliant. It certainly got everyone excited and ready for the 12am fireworks! I was initially worried that the three hours leading up to midnight would drag. However the time seemed to fly by, and after more eating and drinking it was soon time and the countdown began. 10, 9, 8, 7, 6, 5, 4, 3, 2, 1 ... and the fireworks commenced. For the first time in a decade fireworks were coming off the Opera House as well as the Harbour Bridge, it was a magnificent site. The fireworks were unreal I had never experienced anything like it! 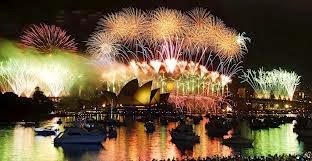 It was incredible to experience Sydney's New Year. It was an added bonus that it was a lovely hot summer evening too! This New Year's Eve is definitely one that I will remember for the rest of my life. I'm also now keen to spend every December in the sunshine! Click here to re-watch the 12am display!